Below we’ve compiled a list of resources that dive into business and marketing assessment, strategy and performance. 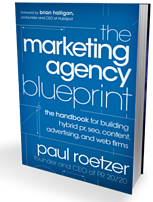 The Marketing Assessment: An on-demand webinar from Paul Roetzer that illustrates how to use your Marketing Score to build campaigns, allocate resources and drive performance. Origins of a Marketing Intelligence Engine: August 2012 blog post that first introduced the Marketing Score concept. SPOS #322 - Scaling the Personal Brand with Paul Roetzer: September 2012 podcast with Mitch Joel (@mitchjoel) that shares details on the Marketing Score product roadmap (fast forward to 25:25 for Marketing Score). Marketing Score Video Demo: Dia Dalsky (@diadalsky) provides a quick demo of the survey, along with tips for taking the assessment and sharing your report. Marketing 101 Resources: A collection of the latest blogs, influencers, events and resources related to advanced marketing strategy. Content Marketing Resources: A collection of resources to keep you on top of the latest trends, and power your organization’s content marketing efforts. Public Relations Resources: Top blogs, books, events and influencers on the topic of PR. Social Media Resources: A collection of the top books, blogs, events, influencers, and more, to keep your team on top of the latest in social media. How to Build Your Inbound Marketing GamePlan: Free ebook available via PR2020.com. B2B Marketer’s Guide to Going Inbound: Free ebook available via PR2020.com. Evolution of the Prototype Marketer—The Hybrids Are Coming: Free ebook available via PR2020.com. Marketing Agency Insider: A hub for marketing agency news, information, resources, training, education and engagement. This community is dedicated to building a more open and collaborative agency ecosystem. Client Services Series: Seven-part webinar event, offering an immersive experience in account management, retention and growth. Blueprint Series: Five-part webinar series that dives deeper into concepts from The Marketing Agency Blueprint.